Cyclic Redundancy check well known as CRC is an error detection code that gives data error cyclic redundancy check if it identifies any changes to the data that is being stored, accessed or transferred onto a storage device like CD/DVD, SD card or a hard drive. In further detail when CRC is set up on a device it forms a codeword for data that is to be stored or sent to another storage media. The code word consists of check values that are calculated block wise before storage of data. While the data is being accessed by computer, the codeword or the check values are compared with current values of accessed data and any mismatch in the values result in data errors. This would mean inaccessible data due to hard drive or SD card corruption. 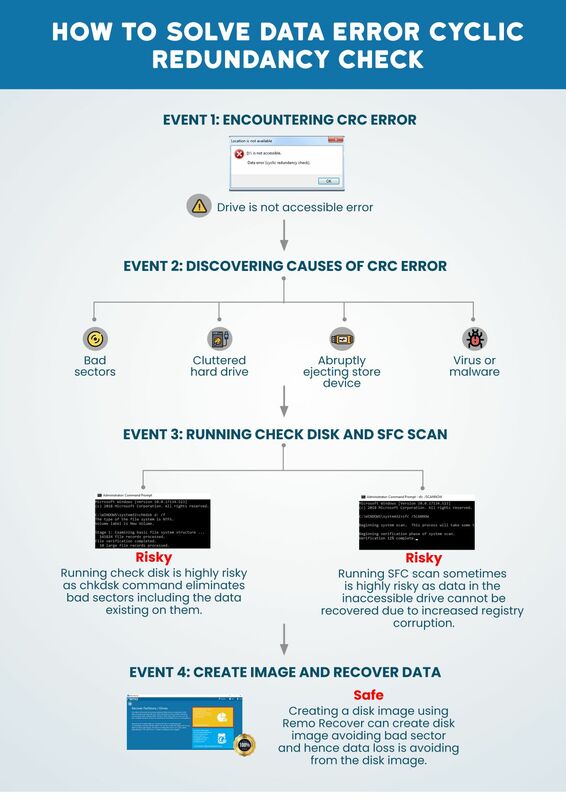 To perfectly understand how to fix data error cyclic redundancy check on various storage devices, beginning with understanding error, solutions are discussed in the form of an event based timeline that concludes with a method that involves least risk of data loss while solving the CRC error. As shown in the image above an error message shows up when you try to open a file or folder in a SD card, hard drive. Usually the data becomes inaccessible due to logical data error (corruption) or physical damage. While it’s common for the CRC error to occur on external hard drives and portable media like SD cards or flash drives, it can also happen to internal drives and its partitions; in cases like these you will find the drive to be unallocated or not initialized in Disk management. Even though you try to initialize the disk from Disk management an error “Cannot initialize disk” comes up. The immediate course of action is to understand the causes in order to fix data error cyclic redundancy check. These above listed reasons cause logical errors except bad sectors. Bad sectors on the hard drive are formed due to physical damage or wear and tear during read/write operations on the storage device like SSD or flash drive. Bad sectors on a storage device can further harm your drive and Windows data existing on the drive. You can create a disk image that has contents and structure of all the data existing on the hard disk. Stick to the end of the article to know the safest way to recover data by creating a disk image. 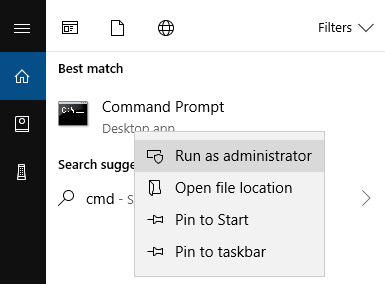 Run command prompt as administrator by typing in CMD in the search box on task bar and right click on the command prompt suggestion to select Run as administrator option. Find the Windows drive letter by opening This PC or File explorer and look for external drive or partition that has Cyclic Redundancy Check error to note the drive letter. Open command prompt by running it as an administrator. After a brief amount of time if you see the message “Windows Resource Protection found corrupt files and successfully repaired them”, restart your computer and reopen the drive without any error. 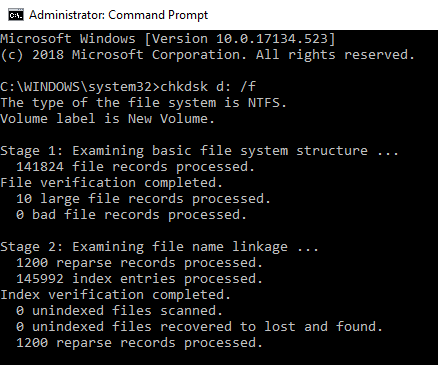 If you see the error message “Windows Resource Protection found corrupt files but was unable to fix some of them”, you would need a more safer and trusted approach like using a data recovery software capable of creating a disk image. Data recovery software, especially Remo Recover can be an excellent work around to data errors indicated by Cyclic Redundancy Check. When corrupted data is accessed multiple times, there are greater chances of data loss. Additionally when the memory card, HDD or SSD has bad sectors, continuously trying to read from the sectors can completely eliminate the chances of data recovery as it further damages the sector. Hence a successful attempt to solve the CRC errors using any of the free methods would still mean that you might not get hands on your precious data. To strictly counter this issue Remo Recover is built with an option to Save Image File. This option allows the software to create an image that has all the contents and structure of data intact in one single file. All the bad sectors are skipped while creating the image and therefore you can later use this disk image to recover data without any further damage. Step 2: Connect the external drive or memory card which has data error to the computer. 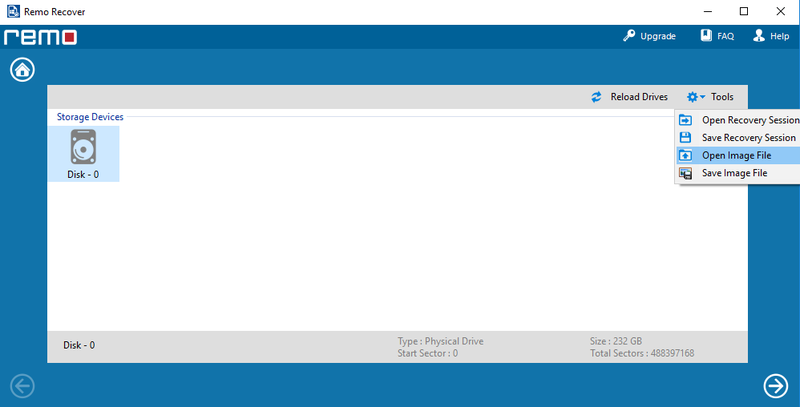 Step 8: After a brief scanning you will find drive image and partitions listed under Drive images (Drives/Partitions) section. Choose the option according to date and size and click on next arrow. Step 9: You will find a list of all the files and folders that were inaccessible due to CRC data error. Use Smart Scan to implement a deeper search mechanism or just select files you wish to recover and click on next arrow and save the files to drive. Step 10: Once you have successfully recovered data from inaccessible drive, format the drive and consequently fix the data error Cyclic Redundancy Check. This way your data is safe and drive can be reused as it is CRC error free.